Welcome to our website - we hope you will enjoy your visit and find lots of useful information, news and updates. ​If you have a query about the Stirling Farmers' Market & you can't find the answer on the website, please email us through the Contact page. 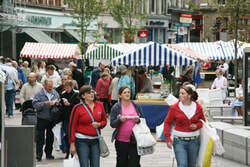 Stirling Farmers’ Market will be back on Port Street this Saturday April 13 from 10am till 4pm with 24 stalls all laden down with fantastic food, delicious drinks and gorgeous gifts. Alongside Stirling’s regular stallholders will be Ally McGrath débuting his fabulous range of handmade Sausage Rolls with a difference! Ally’s selection of tasty fillings is quite astonishing though he particularly recommends the Beef Rueben – “It’s the one I can never get away from, I’ve got a few favourites, but always come back to that one." Now that we’re springing forward into April many of you will no doubt be dusting off your barbeque tongs in anticipation of some half decent weather and what better place to stock up on your al-fresco foodstuffs than the farmers’ market? With a wide range of steaks, sausages and burgers to choose from you’re sure to be able to rustle up the perfect flame grilled feast. You’ll also find a choice of sauces and relishes for spicing things up, delicious cheeses for burger-topping and even fresh baked bread rolls to serve everything on! It’s not just food on offer at this month’s market either with a great range of fruit wines & cider, craft beer, artisan gins and honey meads all available on Port Street too. Regular stallholders will also feature award winning cheeses; macaroons; cheesecakes; free range hens’ & ducks’ eggs; Highland beef; fresh fish & shellfish; artisan breads; preserves & sauces; cupcakes & brownies; wild venison and game and handmade fudge. ﻿Enjoy the great local taste! ﻿﻿Up to 25 stalls offering an outstanding range of superb produce. And where else can you talk to the farmer/producer to find out how the food is grown/reared/made?﻿ Dry-aged Highland beef and lamb in season, pork & bacon, venison and wild game, high welfare rose-veal, fresh plus smoked fish and shellfish from the east coast, great bread in variety including sourdoughs, scones, cakes and puddings, chilli jams, chutneys & preserves, Scottish cheeses and butter, free-range hen/duck eggs, organic vegetables in huge variety, deli items such as olives and pesto, award winning fudge & tablet, great range of savoury pies, country fruit wines, flavoured gins and crafted meads, hand-made jewelry and knitted baby clothes. Copyright 2014 Stirling Farmers Market. All rights reserved.